Yes, a new and powerful beast has taken up residence in my kitchen. It has such a commanding presence that I can’t help but use it again and again. What, you may well ask, is she wittering on about now? I have a new blender, a Froothie Optimum 9200A Next Generation to be precise. Finely grinding many foods, especially fruit, vegetables and nuts enables the body to more easily absorb any available nutrients. Whilst my old blender was useful for making basic smoothies, it wasn’t very efficient at grinding up anything course. This meant, when making smoothies with goji berries for instance, I’d end up with a reddish bitty sludge at the bottom of the jug that wasn’t desperately appealing. I was also unable to make ‘green’ smoothies. I tried with some of our home grown kale once and it was just not meant to be – coconut water with large pieces of kale floating about in it was rather hard to drink. 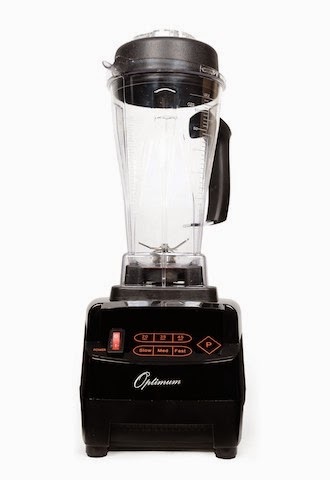 The Optimum 9200A Next Generation, on the other hand, is a high speed super blender with a 2,611 watts motor and a scary top speed of 44,000 revolutions per minute (RPM). The jug which is made of ultra strong, heat-resistant polycarbonate has a 2 litre capacity and can take both wet and dry ingredients. The blades are stainless steel and very sharp. It has automatic blending options, which means you don’t have to hover over your morning smoothie when there are so many other things to be done. It can be set to low, medium or high speed and includes a pulse function. It can blend pretty much anything and can be used to make smoothies, nut butters, ice-cream and even soup. Handily, the jug has measures, for cups, fluid ounces and litres, so can cope with pretty much any measurement you care to throw into it. I have the rather smart black model as shown above, but white, red and silver models are also available. I’ve put it through its paces a few times and conducted a number of tests, all of which it passed with flying colours. When I made a raw chocolate and goji berry smoothie, it was impossible to detect even a tiny bit of goji berry. Our kale blended to a fine green juice and a couple of other ingredients I wasn’t sure about had similarly successful results. I will be posting some of the things I’ve made in due course. I do have a couple of quibbles, but all in all, I am delighted with my new resident beast. The quibbles are on the cleaning front. I’d heard that it was a synch to clean and all that you needed to do was put some water in the jug with a dash of washing up liquid and blend. This works to a point, but of course doesn’t clean the top or lip of the jug. Whereas I used to just dunk my old blender in the washing up bowl along with everything else, it is best not to get the bottom of this jug wet. So cleaning the jug overall is a little awkward. I must stress, this hasn’t put me off using it. I am super excited about its capabilities and will continue to use it on a regular basis. In fact I am a Froothie Ambassador. This means Chocolate Log Blog will get plenty of posts showing some of the things I make in The Beast. It also means that if you buy an Optimum 9200A Next Generation using this link, it won’t cost you any more, but I will get a small commission. Any purchase made includes a one month money back guarantee, including postage and a six year warranty. Do watch out for special offers as the price can vary. You can find some of the recipes I’ve created with it by looking at my Full on Froothie page. I was sent a Froothie Optimum 9200A Next Generation blender to try out in my kitchen. I was not required to write a positive review and as always, all opinions are my own. Top photograph is courtesy of Froothie. Great blender! We went to see Shrek the musical at the weekend….. I am wondering if he is on a regular diet of kale smoothie?….. he was exactly that colour! great to hear your thoughts on your froothie – I have one that I like but I agree the cleaning it is not quite as easy as it sounds – I find cleaning nut butter hardest and usually soak it – but I do love being able to make my own nut butters! that is such luxury. Yes, I saw you had one Johanna, they are rather splendid aren’t they? I’ve had a go at a sort of nut butter Johanna and it took a couple of blends to clean, but wasn’t too bad. I found getting it out of the jug tricky though. Excelllent review, really good to get your take on it. I would love to have one but just can’t justify it at the moment. Maybe one day… for now I will see what delights you come up with. Thanks Ros, it surely is a great addition to the kitchen and I’m using it lots. Very precise review Choclette – I find the cleaning easy, funnily enough, but then I wasn’t making smoothies, so maybe not so much mess! Ah, I’m wondering what your secret is Karen. I’ve made a nut butter as well as a smoothie, but that made even more mess. It could just be that I don’t have much space, so pretty much everything is awkward. It is indeed Jayanthi, I’m really enjoying experimenting with it. Looks great! I keep thinking about one, but not sure I do enough ‘blending’ to warrant it! Now I’ve got one Helen, I’m using it more than I used to use my old one – it can do so much more. I need one of these – I broke my blender crushing ice! Looks wonderful. Need to put aside the pennies. I haven’t tried it yet, but it’s meant to be brilliant at crushing ice Madeleine. Yay! Welcome to the wonderful world of the Froothie! I love my Froothie and could not live without a power blender now, what an amazing green juice ! Yes Helen, I can quite see why. I’m loving being able to blend so many exciting things. I super duper love the froothie and cant wait to try more things in it. Yes, there is so much to try Bintu, it’s very exciting. I don’t know how I missed this Choclette. Good review. I find it super easy to clean. I pour the soapy water from the jug over the lid in the sink, give a wash with a sponge and rinse both under the tap. Thanks Jac, I’m getting to grips with the cleaning now, but I still find it a bit fiddly. Other than that I LOVE it.